Earn up to 14,400 reward points. 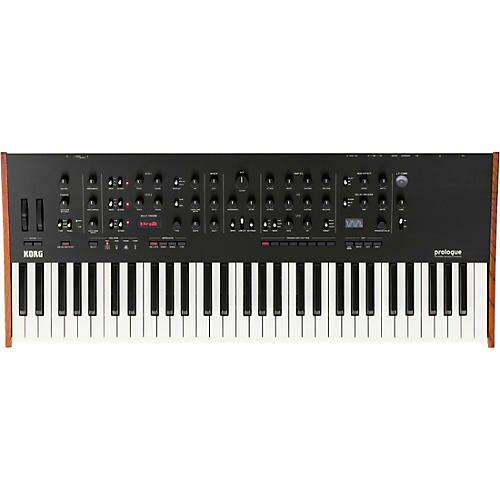 Korg's next-generation, 16-voice analog synthesizer with multi-engine oscillator and more. Prologue is a fully-programmable, full-featured, professional synthesizer. Preceded by the 4-voice polyphonic minilogue and the monophonic monologue, this long-awaited debut marks the Prologue as the flagship of the series. Equipped with a full-sized keyboard, prologue is a polyphonic analog synthesizer with powerful analog circuits that are descended directly from the earlier models of the series. Together with a newly developed digital multi engine and gorgeous DSP-based effects, prologue expands the variety of sounds and the possibilities for user customization. The lineup is comprised of two models that cover musicians’ needs for not only stage use, but also studio, home, or touring use: 16-voice 61-key prologue-16, and the eight-voice 49-key prologue-8. These instruments are capable of sounds that go beyond existing analog synthesizers. The prologue is a polyphonic analog synthesizer with 8 or 16 multitimbral voices. KORG’s analog synthesizer development in recent years has culminated in the prologue, which was designed using 11,000 discrete electronic components. Although the prologue is a flagship instrument, it still retains the inviting feel and accessibility of its predecessors. It features a pure analog path, impeccable sound quality, stunning presence unlike any other poly synth, and the same intuitive interface as the minilogue and monologue, granting you intuitive access to a vast world of analog synthesis. The prologue uses a structure of 2VCO + MULTI ENGINE, 1VCF, 2EG, 1VCA, and 1LFO. In addition to distinctive, original circuitry, such as wave shaping to shape the oscillator’s overtones and a sync/ring switch, prologue also features a two-pole low pass filter with enhanced sharpness, drive that adds powerful distortion, and a low cut (high pass) switch. Every detail has been improved on from minilogue and monologue. Its sound covers every sonic possibility: fat basses, powerful leads, and the beautiful pads that you expect from a polyphonic synthesizer. The ingenuity of prologue goes beyond its analog design. The newly developed multi engine is provided as VCO3, adding digital waveforms and FM. This multi engine, which is equipped with three different sound engines, can be combined with the analog VCOs to expand prologue’s sonic potential far beyond that of a traditional analog synthesizer. There are four types of noise generator, indispensable for percussive sounds or sound effects. Experience how digital filtering can produce direct changes in the color of the noise. The VPM (Variable Phase Modulation) / FM oscillator was newly developed for prologue. Its metallic and sharp sounds with their complex overtones could never be obtained by analog means. With 16 types of oscillator and the SHAPE knob, you’ll be intuitively guided through complex sound design. Combine these wave shapes with Prologue’s gorgeous analog filters, and prepare for sounds you never thought possible. The user oscillator section lets you load oscillator programs of your own creation. Sixteen slots are provided, and one type of morphing wavetable oscillator is built-in as a preset. The high-quality digital effects feature pristine 24-bit floating-point processing, and add a further polish to the sound of the prologue. With two effect units provided (a modulation effect and delay/reverb), you can choose from a wide variety such as chorus or ensemble, warm tape delay, or diverse reverbs. The user effect slots let you load effect programs of your own creation. Open source means that the prologue’s development is ongoing. It provides 16 user oscillator slots and 16 user effect slots, and you can use the dedicated librarian software (expected to be available for downloading around early spring 2018) to create your very own oscillators and effect programs, and load them into prologue. What types of sound will you create by combining the expanded digital oscillators with analog synthesis? You can create original programs and share code to participate in the user community. Start with sample code provided by KORG. The prologue belongs to you. The exclusive VU meter is available only on the prologue-16, and indicates the newly developed master effect L.F. COMP. It’s a low-end booster/compressor using an analog circuit, delivering a solid sense of presence that cannot be obtained from a simple EQ. You’ll particularly notice the difference in high-volume stage performances where maximum dynamics can be utilized. The prologue is a two-timbre synthesizer that lets you play two different programs simultaneously. In addition to layer and split, you can use crossfade to smoothly transition between the main timbre and sub timbre. An ample 16 or 8 voices ensure that the player’s advanced performance needs will be met. The prologue provides voice modes that let you freely combine the 16 or 8 voices for performance. The standard POLY mode lets you play chords with up to 16 or 8-note polyphony. MONO mode is ideal for bass using the sub-oscillator. UNISON allows you to generate thick lead tones by sounding all voices in unison. CHORD lets you play chords with one finger. In conjunction with the DEPTH knob, you can use these modes to obtain a variety of effects. •	POLY: Operates as a poly synth with up to 16 or 8 voices. Turn the VOICE MODE DEPTH knob to switch to DUO mode, in which the instrument operates in unison as a poly synth with up to 8 or 4 voices. •	MONO: Operates as a mono synth with sub oscillator. •	UNISON: Operates as an all-unison mono synth. The powerful arpeggiator opens up a world of limitless inspiration. It provides a four-octave range, and six arpeggiator types including manual set. From phrases that could not be performed on a keyboard to sequence-like sound designs, the arpeggiator can play a versatile array of roles. The program sort function lets you instantly change the sorting order of the 500 programs. You can sort by category, alphabetical order, use LIKE to view the programs that you marked as your favorites, FREQUENT to sort the programs in order of their frequency of use, or ENVELOPE to sort the programs in order of their envelope shape (note duration). By choosing from eight different sorting conditions, you’ll be able to quickly find the sound that you need, without interrupting the tempo of your rehearsal or production workflow. •	LIKE: Sort by programs that you “liked"
•	ENVELOPE: Sort by envelope shape. The attention to detail expected of a flagship extends to prologue’s playability and design as well. The keyboard is a high-quality Japanese-made natural touch keyboard, providing the same superb touch and feel as on KORG’s high-end workstations, and allowing a high degree of expressive power. Prologue’s body emanates beauty and the presence of a boutique synth, and newly redefines the look of a classic synthesizer. The black aluminum front panel features the same curvature as the minilogue, and sports a beautiful hairline finish. Metal knobs with a sense of weight, diamond-cut silver indices, and oak wood side panels are some of the details that emphasize the high quality of this Made-In Japan instrument. Prologue is the top of the sereis, and a must-have addition to any stage or studio!